Constantly on the go? Only able to write your novel at Starbucks? Don't let a bad screen angle slowly transform you into a gargoyle. This portable laptop stand improves posture and viewing angle, but can be quickly folded up and stashed in your bag. Hunching bad! Comfort good! Ultralight stand puts laptop at the perfect angle for increased viewing and typing comfort. Stand folds flat - to just .25" thick - for easy transport so you can enjoy perfect-angle work... wherever you put in hours. 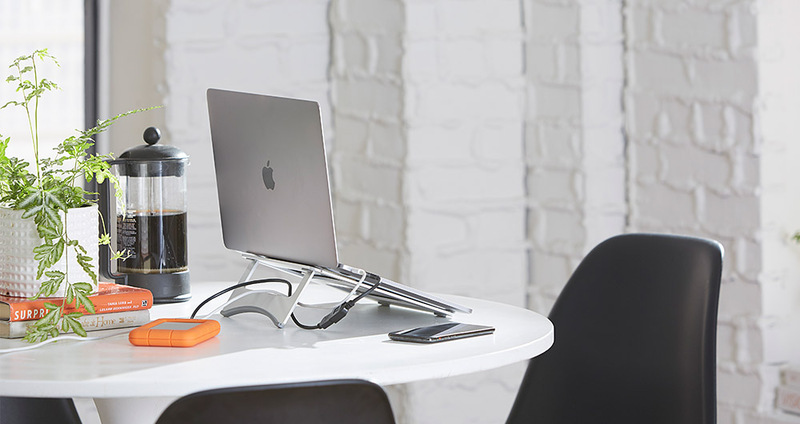 Aluminum stand design is light, but not lacking: Scratch-resistant and surprisingly sturdy - making it perfect for working on-the-go. Ventilated stand design keeps it cool - even under pressure - preventing laptop damage due to overheating. Slip-free stability: Rubberized stand pads keep your laptop steady and prevent desk damage. From one bad viewing angle to another? It doesn't have to be this way! This stand gives your laptop 3.5" of lift, decreasing neck-straining hunch and increasing working comfort. And yeah, that alone's enough to make this stand a winner, but we took it one notch further, just for fun: This stand folds flat, to .25" thick, making it the perfect stand for on-the-go or remote working. Or just travel... with a better view. Screen view, that is. Click the button below to add the Portable Aluminum Laptop Stand to your wish list.